OXFORD, Miss. 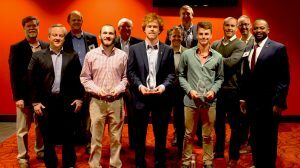 – An online enterprise that helps University of Mississippi students find tutors for their college studies took first place in the 12th annual Gillespie Business Plan Competition, hosted by the UM Center for Innovation and Entrepreneurship. Lee Ingram, a master’s candidate in accountancy from Madison, wowed judges with his presentation for Collegiate Tutoring, a tutoring matchmaking service he started in 2014. Its largest clients are two Greek organizations, and the service has assisted more than 200 students, bringing in revenues of more than $50,000 to date. “Ole Miss is such a fantastic place for students to pursue entrepreneurship,” Ingram said. “There is so much support available from people like Owens Alexander at the CIE, as well as professors like Clay Dibrell and Rich Gentry. Ingram won $10,000 and a year of free office space at the Innovation Hub at Insight Park, the university’s business incubator. Pontus Andersson, a senior from Ridgeland, took second place and $5,000 for his company, Myra Mirrors, which developed a software system that integrates apps into surfaces and mirrors. Third place and $2,500 went to Manalsu Athletics, founded by Austin Darnell, a junior from Wake Forest, North Carolina. Darnell founded Manalsu Athletics in September 2015 with a theme of “Designed for a Life in Motion” after raising $11,000 on Kickstarter for his first product, a high-end style of men’s underwear. He hoped to place in the competition to receive additional funding to expand into other styles of durable men’s activewear. The Gillespie Business Plan Competition is the center’s signature event of the year, said Rich Gentry, associate professor of entrepreneurship and strategy and CIE co-director. The competition is conducted in three rounds. This year’s first round was a review by doctoral candidates of 48 proposals for student businesses. The second round included 15 participants who gave eight-minute presentations to a committee of 16 local and regional business owners and community leaders, and the final round featured six participants who each gave an eight-minute presentation to a panel of nine judges. The final round was conducted April 7 at The Pavilion at Ole Miss. Besides the winners, the final six competitors also included Sujit and Sangeet Adhikari of Dhading, Nepal, whose company, Adhikari Brothers, would produce bamboo as a substitute for wood; Alicia Hydeman a sophomore from Dallas, whose company, Lulu Jax, focuses on women’s apparel for extremely petite women – Hydeman is 4 feet 10 inches tall – and Nathaniel Snyder, a senior from Elburn, Illinois, whose company, Purifico, produces a super-hydrophobic chemical coating designed to improve sanitation on bathroom surfaces. 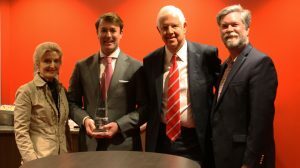 Following the announcement of the winners, Lawrence and Jan Farrington presented Hunter Carpenter, a partner in Redbird Capital Partners in Dallas, with the Farrington Distinguished Entrepreneur of the Year award. “Lawrence and I are both interested in encouraging young entrepreneurs in Mississippi, especially those associated with the University of Mississippi,” Jan Farrington said. “This yearly award provides the opportunity to honor successful entrepreneurs, and also to provide encouragement and inspiration to our students with an entrepreneurial spirit. A four-year letterman on the Ole Miss men’s basketball team, Carpenter earned his bachelor’s degree in 1999 from the UM Patterson School or Accountancy, his master’s in accountancy in 2000 and a Juris Doctor from the UM School of Law in 2003.